Do Bicyclists Have to Wear Helmets in Florida? As a kid, chances are you went for bike rides without wearing a helmet. Most parents today grew up speeding around the neighborhood, helmet-free, and roaming with little supervision until the streetlights came on. They turned out just fine, so why the big fuss over bicycle helmets now? And do bicyclists even have to wear helmets? This is a common argument, and one that is often repeated as new or improved safety technology enters the marketplace. If you were born in the early 1980s or earlier, you probably didn’t sit in a car seat as an infant, either, but few people today would dream of driving without their child fastened in a child car seat. Bicycle helmets are more than just a gimmick for helicopter parents; they have been proven to save lives and reduce injuries. As a personal injury lawyer in Boca Raton, we know how important it is to buckle up behind the wheel or the handlebars, whether you’re fastening a seat belt or strapping on a bike helmet. The head and brain are vulnerable parts of the body, especially in children. Unintentional injuries are the leading cause of death in kids, so it’s important for parents, grandparents, and caregivers to do everything they can to reduce the likelihood of an accidental injury. The Centers for Disease Control and Prevention (CDC) says that motor vehicle accidents and pedestrian accidents – including accidents involving bicycles – top the list of causes of accidental death in kids. According to statistics compiled by the Children’s Hospital of Los Angeles, there are about 275,000 non-fatal bicycle accidents every year, which averages out to around 690 each day. Just because these accidents are non-fatal, however, does not mean they don’t result in serious injuries. Experts estimate that bicycle helmets can prevent between 39,000 and 45,000 traumatic brain injuries every year, along with 18,000 to 55,000 scalp and facial injuries annually. Tragically, some bicycle accidents are fatal, but helmets could help here, too. Experts also say bike helmets can prevent up to 75 percent of fatal head injuries in children. Helmets could have helped prevent 135 to 155 deaths. You know your child needs a helmet, but what does the law say about bike helmets on kids? 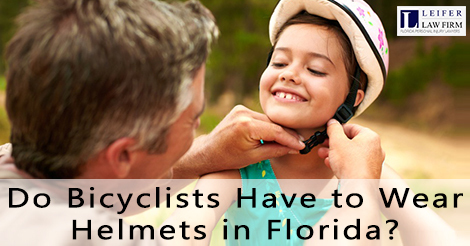 According to Florida law, bicycle helmets are mandatory for all children under 16 years old. Furthermore, the helmet must be properly fitted and fastened securely on the child’s head with a strap. Of course, a bicycle helmet is at its most effective when it is fitted properly. If you’re unsure about your child’s bike helmet, there are many great websites that walk you through fitting the helmet to your child’s head. Learn more here about how to make sure a bike helmet is a good fit. Just because Florida law does not require helmets for bicyclists age 16 and up does not mean adults should go without them. According to one doctor who is a member of the American College of Emergency Physicians, wearing a bicycle helmet is the “single most important thing” a person can do to determine “whether or not you live or die from a bicycle accident”. There are numbers to back this up. For example, in 2008, 91 percent of bicyclists killed in accidents were not wearing a helmet. Although no state in the country requires individuals over age 17 to wear a helmet while bicycling, research shows bicycle helmets are just as important for grown-ups as they are for kids. Furthermore, wearing your helmet when you bike sets a good example for your children. By teaching them the importance of safety early on, you are ensuring they practice a lifetime of safety precautions. Hopefully, this has answered your question: Do bicyclists have to wear helmets? More than that, however, it has hopefully given you some important information about why helmets are a critical safety measure for your kids and for you. For additional information, call today to speak to a bicycle accident lawyer in Boca Raton. Ride safely!